SAVE 50% ON PAINT TOOLS! Professional quality latex gloves are made from natural latex rubber and offer ideal protection for painting, first aid, health care, and baby care! 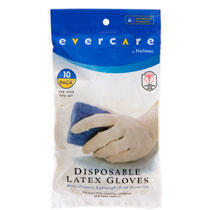 Protective latex gloves are also useful for cleaning, painting, hobbies, pet care, hair coloring, and so much more. In addition, packages are peggable for easy resale display. Latex Gloves are one-size-fits-most and fit left or right hands.